While Jon Jones and Brock Lesnar’s positive drug tests at UFC 200 have left another black mark on the sport of mixed martial arts, Gilbert Melendez (pictured) is one fighter who must be privately happy that Jones and Lesnar are dominating the MMA headlines for their PED results. The former UFC lightweight top contender will end his yearlong testosterone suspension Saturday when he battles Edson Barboza at UFC on FOX 20. 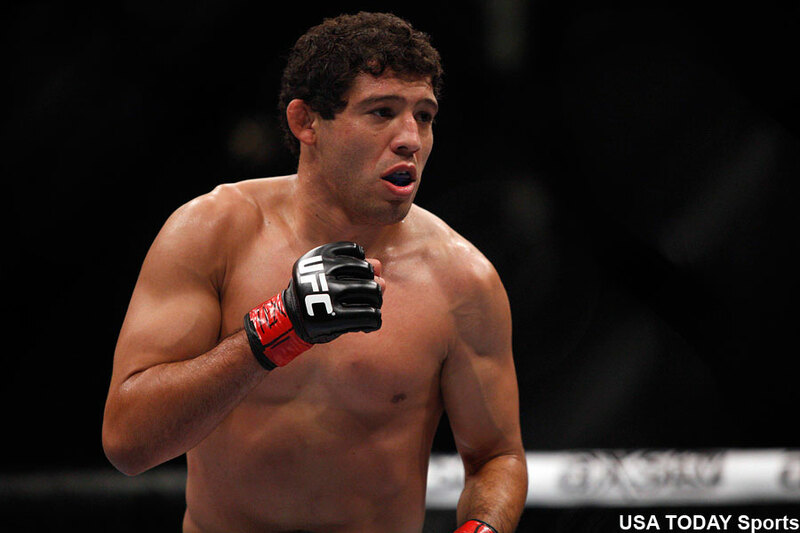 Melendez hasn’t been seen since dropped a split decision to Eddie Alvarez last June at UFC 188. Not too many moons ago, Melendez and Alvarez were neck-and-neck as the world’s best lightweight not competing in the UFC. While Melendez came up short in his UFC title fight against then-champ Anthony Pettis, Alvarez realized his dream this month by dominating Rafael Dos Anjos to claim the crown. Huh? Melendez thinks he “won”? Even if one of the two judges who didn’t rule in his favor switched their vote, Melendez’s “win” would have been overturned to a no contest and he still would have been banned one year after testosterone metabolites were discovered in his system for the fight. Melendez should be thanking his lucky stars that the event took place prior to July 1, 2015 when the UFC kicked in their stricter drug testing policy, where guilty first-time offenders are levied two-year suspensions. I’ve never seen a fighter lose a scrap to a clean athlete while being hopped up on a performance-enhancing drug and spin the situation in his favor, but Melendez has done just that – at least he’s trying to. It was essentially the same spiel sports fans have become numb to after hearing pro athlete after pro athlete regurgitate the same line in professing their I-didn’t-know innocence after a flunked drug test. However, nobody is talking about Melendez’s cheating ways today thanks to Jones and Lesnar. And nobody is happier about that than Melendez. Instead, Melendez, who has dropped three of his past four scraps, including two straight since making his long-awaited UFC debut in April 2013, thinks he’s right back in the lightweight “mix” with a win over the dangerous Barboza. “I’m not campaigning for the title or anything like that, but it does [put me back in the mix],” Melendez stated. “I’ve been through the murderer’s row since day one of my career. I’ve been fighting undefeated fighters, three fights in. I’ve been fighting top-of-the-world since whenever.